Our Satellite connection was lost yesterday. The day before the Olympics start. Sigh. I don't know when the repair man will be able to make it, seeing as how this is a long weekend, but at least we'll be able to watch some of the games at B's mom's house on the weekend. Tonight: Opening Ceremony celebrations at the Speelmanses! 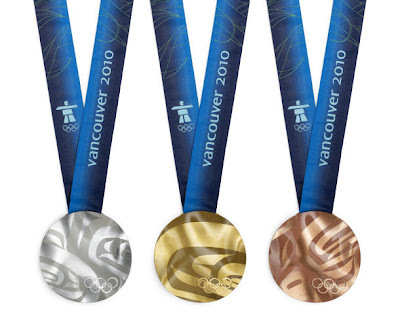 I'd like to be where my coworker is right now: racing to pick up her tickets in New Westminster to watch the Opening Ceremonies, preparing to see some events tomorrow. I'm a wee bit jealous. She'd better have fun! So it's apparently old news, but did you know that the 2010 Olympic medals are made from recycled computer circuit boards and CRT monitors? They are also remarkably not-flat. I hope, for the sake of those winning the gold, that there has been at least a little bit of real gold incorporated into the design. David came home for a few weeks - it was great to spend some time with him! Steve, Dave, and Brian spent some time in the dining room making some great (and loud) music! Steve and the gang are entranced by Uncle Dave's gift. Put a sock in it! Liam enjoys eating his socks. I love this beautiful face. Uncle Eric and Nadine enjoy the Stinky Cheese Man. Grandma, Eli, & Liam have an interesting conversation. Sarah and Eli talk about baby Silas. This child's smile is the most contagious smile that I have come across. I can't help but grin when he beams at me with that smile and says, "Hi, Auntie Jenn!" as though I've just made his day by entering the room. I haven't. But I'm pretty sure that one of his spiritual gifts is making people feel loved.